Imagination, invention, adventure, romance: it was a remarkable half-century, the foundation for the modern era. 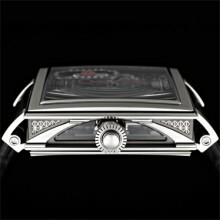 It gave birth to everything from electricity to radio to cinema, Art Nouveau to Art Deco, automobile to airplane, jazz and skyscrapers and, indeed, the wristwatch. Its heroes and icons included Jules Verne, Rudolph Valentino, the Wright Brothers, Bix Beiderbecke. It was only natural that this extraordinary period would inspire the latest – and boldest – creation from Jean Dunand. Embodied in the Palace, in this single watch, is the house’s entire ethos. According to Jean Dunand’s CEO Thierry Oulevay, “The primary inspiration of the Palace is the cultural and societal transformation of Western civilisation during a 50-year period, defined as 1880-1930.”Placing that time span in context, the Palace takes its name from the structure that preceded and heralded the age, London’s Crystal Palace, built for the Great Exhibition of 1851, while sharing aesthetic details with the architectural pinnacle of the era: the Eiffel Tower. It was a time when the mechanical dominated, when manpower and foundries and steam and nerve accomplished what is now achieved by electron and computer. The Palace embraces this hard-edged industrialism, tempered by the witty, alternative vision of Steam Punk, the imagery of Fritz Lang’s Metropolis, the nuts and bolts and gears and pistons of trains and submarines. The look could belong to no other period in history, yet the Palace’s movement pushes the boundaries of modern complications. From the atelier of Christophe Claret comes a calibre that marries state-of-the-art functions with the topology reminiscent of a century past. It transcends the merely “retro”, for it adds substance to the style. At the heart of the manually-wound Palace beats a one-minute flying tourbillon, placed at the 6 o’clock position, the balance operating at a frequency of 3Hz. 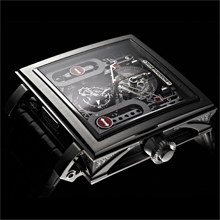 Above it are skeletal hour and minute hands, and a sapphire crystal 60-minute counter for the chronograph. On either side of the flying tourbillon are two vertical tracks, the one in the right-hand corner charting its 72-hour power reserve, theother a linear GMT indicator. Instead of a rotary dial, the Palace shows its second time zone through 12-hour indications on either side of the oval-shaped trace. Its form reminds the wearer of the legendary “Milwaukee Mile” racing circuit, which hosted its first automobile race in 1903, and witnessed battles between early motoring giants such as Ralph DePalma and Barney Oldfield. The indicator arrow, mounted in a disc that mirrors that of the power reserve, makes two passes. When the disc reaches the end, it flies back to the top and the arrow rotates 180 degrees to chart the other scale. Adjustments to the GMT scale, in one hour increments, are made through the GMT advance button positioned between the lugs at 6 o’clock. Providing structure to the movement are plates which are ridged to suggest the reinforcement of a massive, cast-iron structure. The plates are separated and supported by ten minuscule pillars, visible through the arched glass windows in the case’s sides. Other details – cast, machined, engraved – recall the cross-pieces found in both the bridges of the era and the form of the Eiffel Tower. Paris’ most iconic edifice also inspired the Palace’s side view: the arches look exactly like the Eiffel Tower’s base. So complex and detail-rich is the Palace that each will be supplied with a loupe, to enable the owner to study it over the years. Its many details and secrets will reveal themselves surreptitiously, the observer finding something new to admire every time it is examined. Such a wealth of function, form and detail demands a stately enclosure: at 38mm by 36mm the movement is larger than most complete watches, so the majestic case is a generous 48mm by 49mm providing the spaciousness a Palace deserves. 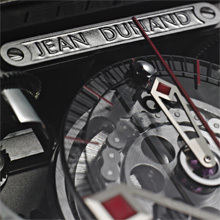 Jean Dunand exists to create exceptional timepieces. With the Palace, this maker redefines the form of the mono-pusher chronograph, augmented by the GMT function and flying tourbillon. And it is fitting that the era which inspired the Palace has a personal significance for Jean Dunand: the watch represents the decades that correspond almost exactly with the lifespan of the master-craftsman who gave this watch house its name. Dimensions: 48.2 x 49.9 mm. fashioned in 18k red gold or white gold. Fitted with matching deployant clasp. Two domed, non-reflecting sapphire crystals. Two non-reflecting lateral windows in sapphire crystal. “Big seconds” chronograph hand in Pfinodal alloy.